War against Casteism from Ramayana Days! Post No.1126; Dated 23rd June 2014. Many of us think that the reformers of 19th and 20th century only fought against the divisive caste system and before that everyone was very caste conscious and strictly followed the rules laid in the Smritis (Hindu Law Books. It is a false notion created by the English educated writers of the 18th century who did not study the religious literature in Tamil, Sanskrit and Marathi. From the days of Lord Rama and Lord Krishna, people gave respect to any one sincere and truthful. Educated were respected irrespective of their castes. There are innumerable anecdotes in the Hindu epics Ramayana and Mahabharata. 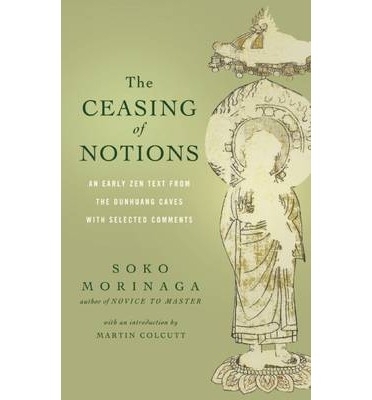 I would like to narrate a few and compare them with the saints of Tamil literature. Lord Rama embraced Kugan, who was a tribal leader and chieftain of the hunters (Ayodhya Kanda). He also embraced Jatayu, leader of the vultures (actually vulture tribe). He ate the fruits, half eaten by the tribal woman Sabari (Both in Aranya Kanda). He took into his fold Sugreeva (Kishkindha Kanda), a leader of the monkey clan/tribe and Vibhisana (Yuddha kanda), leader of the Rakshasa tribe. He treated all of them as his own brothers, according to Kamban who adapted Valmiki Ramayana in Tamil. “We became five brothers with Guha, six when we met Sugreeva, and Vibhisana! Now with you, we are seven brothers”. Some of the verses in Tamil Kamba Ramayana are not found in Valmiki Ramayana; but he might have taken some verses from the other two Ramayanas : Vashista and Bodhayana Ramayanas. Kamban himself referred to the great three Ramyanas available at his time (12th Century CE). Above all these, Rama sent Sita to Agni Pareeksha (Fire Walking Test) and to the forest because of a gossip among the washer men (dhobiwalas). He did not reject it because it came from a low caste person. In the Mahabharata, we have the example of Dharma vyadha, a meat vendor, answering many questions put forward by sage Kausika. Even the Shambu incident in the Uttara Kanda of Valmiki Ramayana looks like an interpolation. Shambu , a Shudra, was killed by Rama just for doing penance! Several parts of Uttara Kanda go against the spirit of Ramayana. Nowhere else in the Ramayana, caste played any significant role. 2000 year old Sangam Tamil literature has several examples where caste was immaterial in the field of education and social life. Purananauru verse 183 by Pandya king Neduncheziyan says that the educated only will be respected even if he belongs to the lowest of the four castes. Manu also said that a high caste person can go and learn from a person of low caste, where it is necessary. Kabilan, a Brahmin poet who contributed the highest number of poems in the Sangam literature, was praised by many famous poets. He was a good friend of Pari, a chieftain who attained fame through his philanthropy. Pari was killed by the conspiracy of three powerful kings Chera, Choza, Pandya. Then Kabila took charge of Pari’s two Kshatria daughters Sangavai and Anagavai and went to every chieftain for refuge or marriage. Lot of chieftains refused to accept the girls for the fear of enmity with the three powerful Tamil kingdoms. At last a chieftain in Thirukoilur area was bold enough to accept the girls. Kabilar felt very happy of fulfilling his life time mission and then self immolated himself. An inscription and a memorial were installed at that place. He was the first Tamil known to History who did community service, without bothering about caste. Then the Saivite and Vaishnavite saints of the sixth and seventh centuries followed Kabilar who did not care about the caste rules. Though there were some protests from the orthodox sections, all melted away like wax in the fire. 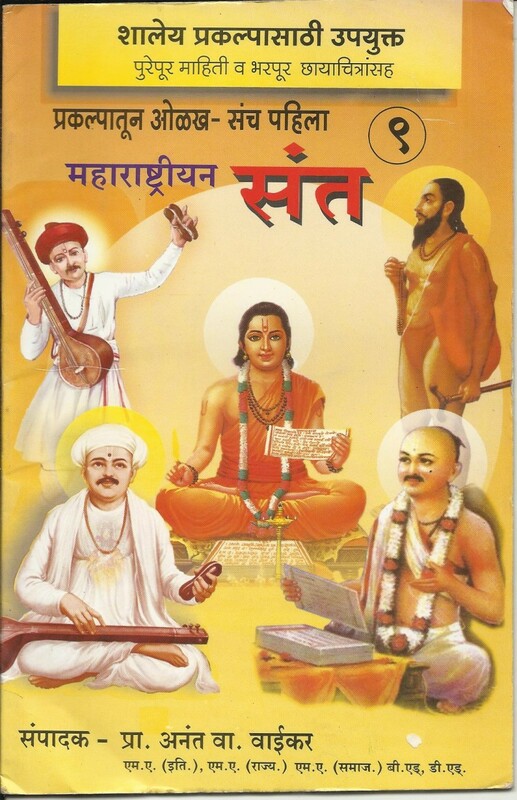 Saivite saint Sambandhar walked hand in hand with Neelakanda Yazpanar of lower caste. Appar sang that even a Pulaya (lowest) would be respected if he is a devotee of Lord Shiva. Vaishnavie saints from the lowest castes had the same respect of their counterparts from higher class. We saw similar scenes in Maharashtra with all the saints of low castes, not only respected but also worshiped. Apputhi adikal, a Brahmin devotee of non Brahmin saint Appar also known as Tirunavukkarasu, named everything in his vicinity after Appar. He named his sons, the Free Water Distribution Pandal (watershed), the weights in the household — everything after Appar. When Appar visited him in disguise and teased him about naming everything after a person who he never met, he became very angry. Then Appar revealed his true identity and Appudi Adikal fell at his feet. Now we know that it is not the reformers of 19th century who created this awareness and they were not the pioneers. They simply continued what Vyasa and Valmiki advocated in the two epics. The Bhakti movement in Tamil Nadu and Maharashtra had innumerable saints from the lowest castes who are worshipped until today. They were the pioneers of reformation. Post No. 1120; Dated:– 20th June 2014. Tiruvannamalai in Tamil Nadu is famous for many things. 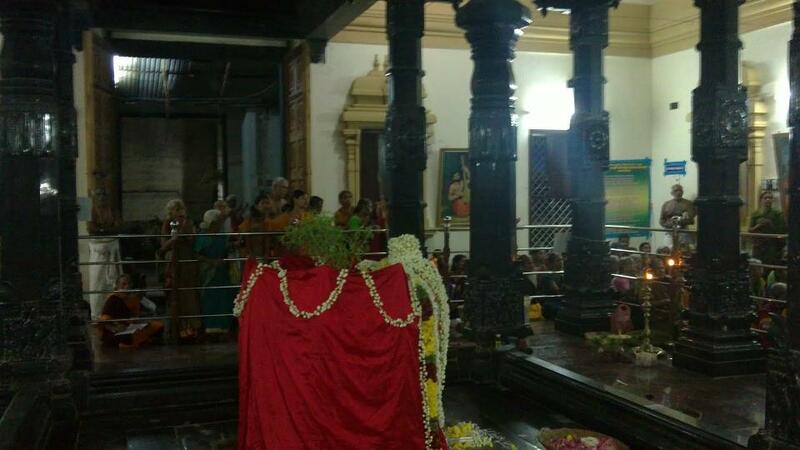 This is one of the Five Main Shrines (Pancha Bhutha Sthala) of Lord Shiva. Lord Shiva is in the form of Agni (fire) in this shrine. 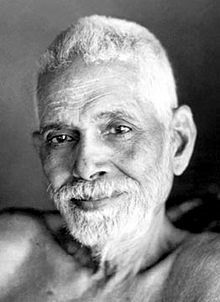 It is also famous for several saints including Arunagiri nathar (author of Tiruppugaz in Tamil), Sri Ramana Maharishi and Sri Seshadri Swamikal. 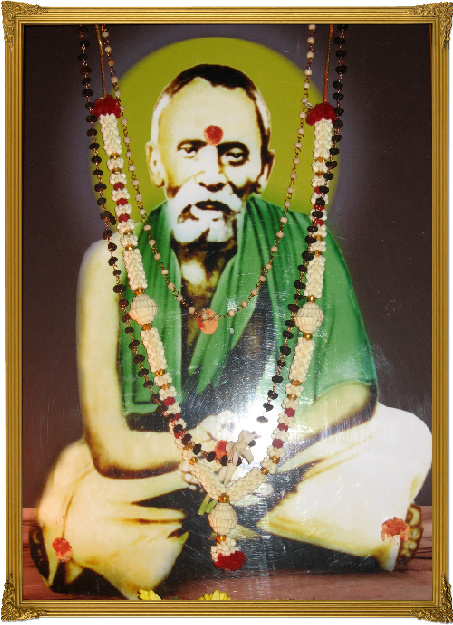 Ramana is known to all spiritual aspirants around the world. But Seshadri Swami is not known to many outside Tamil Nadu. His life was full of miracles. Studying his life shows how the world looks at a budding saint, how the family puts all the hurdles in one’s spiritual path and how one becomes great saint at the end. Seshadri was born (22 January 1870) in Kancheepuram. The city of Kancheepuram was the capital of Pallava Dynasty for several centuries. Its fame spread throughout India because of its great temples and university. It was the Nalanda of the South. One of the Chalukya kings conquered Kanchi but not to touch a single stone. Because it was so beautiful he ordered his soldiers not to destroy it. Long ago, Adi Shankara brought 30 families from the North to Kanchi, because of shortage of Shakta practitioners. They were known as Kamakoti family, well versed in Sri Vidya Worship. Seshadri was born in that family to Maragatham and Varadarajan. Seshadri’s mother Maragatham was extremely beautiful and well versed in arts and Sanskrit literature. Seshadris father Varadarajan died when Seshadri was young. His death came on the appointed day as he correctly predicted before. 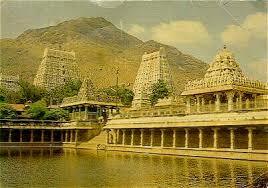 After a few years his mother Maragatham also died saying the name of Arunachaleswar, God of Tiruvannamalai. Hindus believe that any one dying with the thought of Arunachal (Tiruvannamalai) gets liberated from the cycle of birth and death. His mother’s death with the words of Arunachala Siva made a deep impression in Seshadri’s mind. He used to draw the hill of Tiruvannamalai and offer puja (worship) to it. Though Seshadri mastered lot of Tamil and Sanskrit scriptures, his mind was only thinking of god. His behaviour was very strange and similar to that of a mad man. For hours doing Puja in a secluded place or behind the closed doors and even at the crematorium was the order of the day. When the elders in the family warned about going to crematorium and getting all the ‘impurities’ it did not bother him. He made every one dumbfound by arguing with a great scholar about it for three hours in Sanskrit! A section of Hindus believe that doing prayer at the crematorium will increase its effect tenfold. But one must have proper maturity to do it. The last warning came that he can’t enter the house once he goes to the crematorium for pujas. He was waiting for those words. From that day he did not enter the house. Every spiritual aspirant needs a guru for proper initiation. 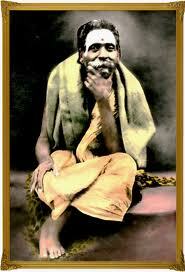 Seshadri was lucky to get one North Indian Guru by name Balaji Swami who came to Kanchi on his way to Rameswaram. Seshadri took Sanyasa (vow to lead an ascetic life) from him and proceeded to Tiruvannamalai where he stayed for next forty years. When he was a child a few miracles happened which showed that he was going to become great. Once when his mother took him to the temple, a seller was selling Krishna idols. When he asked for one, his mother hesitated. The vendor was ready to give him free of cost. At last mother bought him one. But Seshadri was allowed to choose one from the pile. He put his hands through the pile of mini statues and chose one. As soon as he left all the figures were sold which never happened in the life of the vendor. Next time when his mum took Seshadri to the temple he came running and kissed the hands of Seshadri and touchéd his feet saying that he was a divine child. From that day he was known as Golden Hand Seshadri. When one of the family friends came to his house asking Seshadri for his daughter, the eldest in the family told him loud and clear that he can’t be married because his horoscope was an ascetic’s horoscope. Though everyone in the family resented it, his statement came true. What happened in Seshadris younger days never stopped even when he became old. If he went to a shop and touched any eatable with his “unclean” hand, no shop keeper would object to it, because that shop would do a roaring business on that day. He used to throw out articles from the shop. But vendors were waiting for that moment. His control over animal world also was also amazing. I have already written about it in my post “Mysterious Tamil Bird Man” (Posted on 19th April, 2012). He called hundreds of beautiful birds of different varieties at the backyard of a house, just to amuse his devotee!!! Another time a snake was coming quickly towards him. All his friends ran for life. But Seshadri called the snake and it climbed over him and spread its hood over him like an umbrella. He used to bathe several times every day and he was given a nickname “cormorant” (water crow in Tamil). His behaviour was like a mad man. He used to laugh for an hour without any rhyme or reason, looking at the sky and “listen to the heavenly music of the Gandharvas (Singers in the heaven)”. There was another holy man by name Vitobha Swamil at Polur near Tiruvannamalai. He fell sick and told his devotees that he would ‘depart’ within three days. One day Seshadri looked at the sky and was shouting “Vittobha going, Vittobha going”. Within a short time people received the news of Vittobha’s death from the nearby town. As he was a Tri Kala Jnani, he could see the present, past and the future events. There are scores of anecdotes like this in his life. He never did any miracle for the sake of miracle to attract people. No one could predict what he was going to do next minute. In Tamil there is a proverb meaning Siddhas and beggars have the same style/attitude (Siddham Pokku Sivam Pokku; Andi poku adhe pokku) . Seshadri Swami was a typical example of this saying. He visited the house of Judge Sundaram Chettiar once. He started playing with him by throwing his upper garment on his neck like a garland. This he did several times. Soon he was promoted as a High Court Judge. Once he sat on the pyol (Thinnai in Tamil) of a poor cart man’s house. The old woman in the house gave him porridge. He asked him to sell the cart and the bull. Next week he got married to a rich woman and he sold his bullock cart and migrated to Madras. So many good things happened to so many people. His look can destroy even the past karma and change the future to good. Venkatrama Iyer was working as a teacher at Danish Mission High School. Because of jealousy of a few people he was about to be dismissed. One day he saw Swamikal coming and took off his shoes and fell at his feet. But contrary to his expectations of blessings, he was beaten with his own shoe several times. Venkatrama Iyer was shocked. When he went to his school he saw an envelope on the table. He felt very bad and opened the envelope thinking that it was his dismissal order. But he was promoted as the Head Master of the school. Swami can eradicate anyone’s past bad karma. Sivaprakasa Mudaliyar was a Sub Inspector of police. He was stopped on the road by the Swami and was asked whether he would accept ten rupees more. He told Swami that he would be glad to take it. Swami put his dirty cloth on him and took it. When he saw his superiors on the same day he was given ten rupees increment! He did penance at the Durga Temple at the foothill. He advised his devotees to follow Rama instead of reading Ramayana. 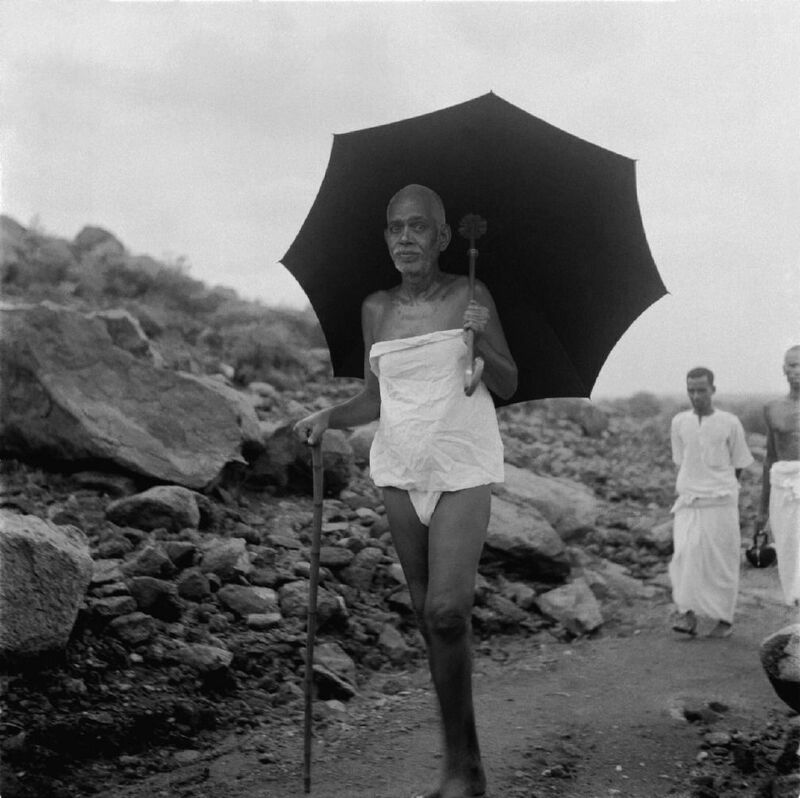 Ramana Maharishi came to Tiruvannamalai after Seshadri. 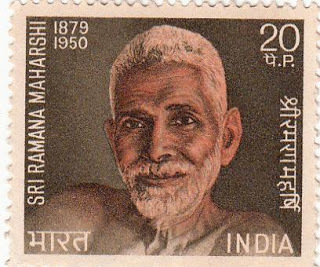 When Ramana was doing severe penance, insects were crawling over him and he was bitten by the insects. 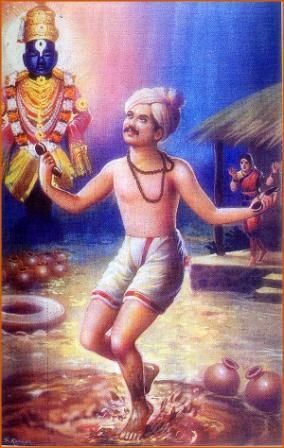 Seshadri Swamikal saved Ramana and revealed him to the world as a saint. When Seshadri Swamikal died Ramana took part in the funeral procession. Seshadri Swamikal also predicted his death and died in 1929 after a serious illness. His Samadhi ( holy grave where his body is buried) is very near Ramanashram (The author was fortunate to visit both the Ashrams). A lot of people were cured of their sicknesses and received advice from him. Even now the very thought of him or a prayer to him would do wonders. 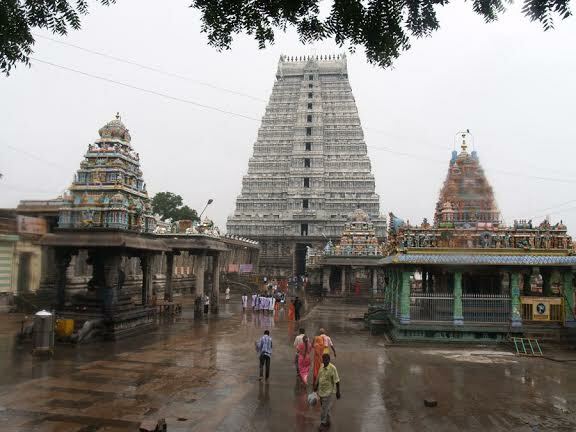 Next time you visit Tamil Nadu, don’t forget to visit the two great Ashrams of Ramana and Seshadri at Tiruvannamalai. Seshadri Swamikal’s full life history is available in Tamil and English. கல்லுக்குள் தேரை, பெட்டிக்குள் எறும்பு: உணவு கொடுப்பது யார்? பார்வதி:– என்ன இது? இப்படி எப்போது பார்த்தாலும் ‘டான்ஸ்’ (நடராஜன் ) ஆடியே பொழுதைக் கழிக்கிறீர்களே. கொஞ்சம் பசியால் வாடும் உயிரினங்களுக்கு உணவு அளிக்கக்கூடாதா? பரமசிவன்:- அன்பே! ஆருயிரே ! அதைத்தான் ‘’இமைப்பொழுதும் சோராமல்’ அல்லும் பகலும், அனுவரதமும் நான் செய்து கொண்டிருக்கிறேன். பார்வதி:– அப்படியா! எனக்கு என்னமோ நீங்கள் ‘’நடராஜ’’னாகப் பொழுது போக்குவதே கண்களுக்குத் தெரிகிறது! 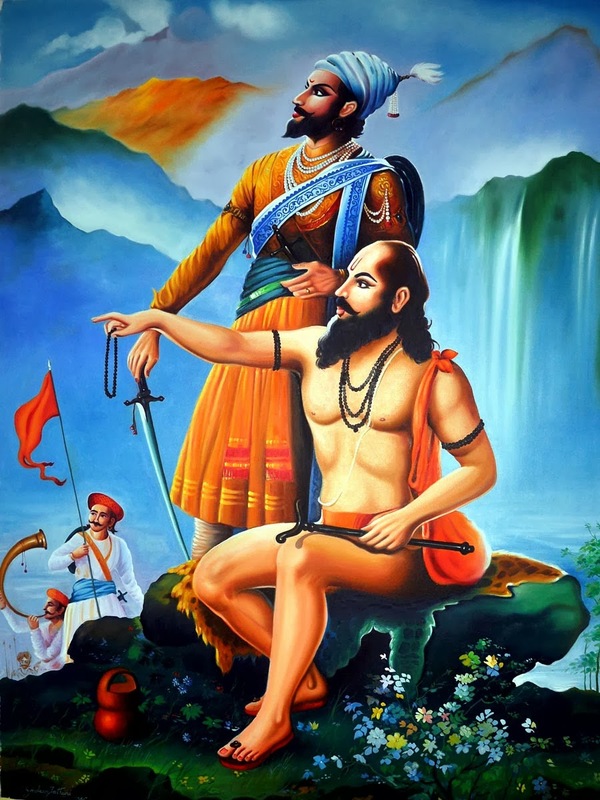 Picture of Shivaji and Samarth Ramdas. பரமசிவன்:- நீ ஒரு பெண்; கருணையின் வடிவம்; ‘பால் நினைந்தூட்டும் தாய்’! ஆகையால் பசியில் வாடும் உயிரினங்களின் மேல் எப்போதும் கருணை பொழிகிறாய். எனது நடனம்தான் இந்த உலகையே இயக்கிக் கொண்டிருக்கிறது. உனது கருணை அதை மறைக்கிறது போலும்! இப்படி சிவன் கொடுத்த தத்துவ விளக்கம் எதுவும் பார்வதிக்கு நம்பிக்கை தரவில்லை. தன் கணவனை ‘’கையும் களவுமாகப்’’ பிடித்து குற்றவாளிக் கூண்டில் ஏற்றுவதற்குத் திட்டம் போட்டாள். விறு விறு என்று வெளியே போய் அங்கே ஓடிக்கொண்டிருந்த சில எறும்புகளைப் பிடித்து ஒரு டப்பாவுக்குள் போட்டு மூடி வைத்தாள். மீண்டும் அதே நாளன்று பொழுது சாயும் நேரத்தில் சிவன் ஆடத் தொடங்கினார். பார்வதிக்கோ ஒரே ஆத்திரம். ஆட்டம் முடிந்தவுடன் சிவனை மீண்டும் வம்புக்கு இழுத்தாள். பார்வதி:– அன்பரே! இன்று எல்லா உயிரினங்களுக்கும் உணவு படைத்தீரா? பரமசிவன்:- ஆமாம், தேவி! ஒரு உயிரினத்தையும் விடவில்லை. எல்லோருக்கும் உணவு அளித்துவிட்டேன். பார்வதி:– ஓ,அப்படியா? இனி நீர் என்னிடமிருந்து தப்பிக்க முடியாது. காலை முதல் என் முந்தானைக்குள் முடித்துவைத்த இந்தச் சின்னப் பெட்டியில் எறும்புகள் இருக்கின்றன. நீர் இந்தப் பக்கமே வரவில்லையே! இவைகளுக்கு ஏனைய்யா உணவு படைக்கவில்லை? பரமசிவன்:- தேவி! அவசரப் படாதே, ஆத்திரப் படாதே. பெட்டியைத் திறந்து பார். பார்வதி, பெட்டியைத் திறந்தாள். எறும்புகள் இன்பமாக அரிசியை சாப்பிட்டுக் கொண்டிருந்தன. சிவன் வாயில் புன்சிரிப்பு நெளிந்தது. பார்வதி முகத்திலோ அசடு வழிந்தது. “எங்கும் நிறைந்த, எல்லாம் வல்ல, எல்லாம் அறிந்த” இறைவனை வெறும் ஆட்டம் (நடராஜன்) போடுபவன் என்று நினைத்து விட்டோமே, உலகையெல்லாம் ஆட்டிப்படைக்கும் ஆட்டம அல்லவா தம் கணவனுடைய ஆட்டம் என்று எண்ணி எண்ணி மகிழ்ந்தாள். தென்னாட்டில் முஸ்லீம் படை எடுப்பாளர்களை ஒடுக்கியது விஜய நகரப் பேரரசு. அதற்குப் பின்னும் வட நாட்டில் அவுரங்கசீப்பின் அட்டஹாசம் நீடித்துக் கொண்டே இருந்தது. அப்பொழுது மஹாராஷ்டிரத்தில் மலைப் பகுதிகளில் வாழ்ந்த மக்களை ஒன்று திரட்டி உலகின் முதலாவது ‘கெரில்லா’ போரை நடத்தியவர் சிவாஜி. வீர சிவாஜியின் இந்து சாம்ராஜ்ய ஸ்தாபிதம் அவுரங்கசீப்பையும் மொகலாய சாம்ராஜ்யத்தையும் விழுத்தாட்டியது. வீர சிவாஜியின் வெற்றிக்குக் காரணம்—பவானி தேவி கொடுத்த வாளும், சமர்த்த ராமதாஸர் கொடுத்த ஆசியும் என்பது கொஞ்சம் கொஞ்சமாக சிவாஜியின் மனதில் இருந்து அகலத் தொடங்கியது. அஹங்காரமும், மமகாரமும் ( ‘யான்’, ‘எனது’ என்னும் செருக்கு—குறள்) பெருகவே, சிவாஜிக்கு சமர்த்த ராமதாசர் ஒரு பாடம் கற்பிக்க நினைத்தார். நல்ல தருணமும் வந்தது. ஒரு நாள் மாபெரும் கோட்டை கட்டும் வேலையில் ஆயிரம் தொழிலாளிகள் ஈடுபாடிருந்தனர். சிவாஜி, பெரும் மமதையுடன் அதை மேற்பார்வை இட்டுக் கொண்டிருந்தார். நான் இல்லாவிடில் இந்த மலை ஜாதி மக்களுக்கு சோறும் தண்ணீரும் கிடைத்து இருக்குமா? என்ற எண்ணம் அவரது மனதில் இழை ஓடியது. அப்போது அங்கே ராமதாசரும் வந்து சேர்ந்தார். “சிவாஜி! ஒரு பெரிய பாறையை உடைக்க வேண்டும். நாலைந்து தொழிலளிகளைக் கூப்பிடு” என்று குரு ராமதாசர் உத்தரவு இட்டார். குருவின் இந்த விநோத வேண்டுகோள் வியப்புக் குறியை எழுப்பியது. இருந்த போதிலும் குரு விஷயத்தில் கேள்விக் குறியை எழுப்பி அறியாத மாபெரும் பக்தன் வீர சிவாஜி. உடனே உத்தரவு பறந்தது. வந்தனர் தொழிலாளிகள்– வெட்டி உடைத்தனர் பாறையை– என்ன அதிசயம்!! அதற்குள் சிறிய தூவாரங்களில் தண்ணீர். அதில் சில தேரைகள்! எல்லோரும் வியப்புடன் பார்த்தனர். சிவாஜி! இவைகளுக்கும் நீதான் உணவு படைக்கிறாயா? என்றார் குருதேவர். சிவாஜிக்குப் புரிந்தது. அகந்தை அகன்றது. குருதேவரின் காலில் விழுந்தார். கண்ணிர் மல்கினார். குருவின் ஆசி பெருகியது. காவிக் கொடிகள், மேலும் பல மொகலாயர் கோட்டைகளை வென்று, அவைகளின் மீது பட்டொளி வீசிப் பறந்தன! “அடக்கம் அமரருள் உய்க்கும்”— வள்ளுவன் குறள்.—சுபம்–. Post No. 1118; Dated 19th June 2014. There is a popular story about a conversation between Shiva and his wife Parvati. Shiva’s wife was annoyed at his idleness. Like every mother likes all her children to be fed well, she also asked Lord Shiva to go around the world and feed all the hungry creatures. Though she was the embodiment of love and kindness, she did not realise that Shiva was Omnipresent, Omniscient and Omnipotent. Lord Shiva simply smiled at her and told her that what he was he doing. Parvati was very suspicious about what Shiva said to her. Suddenly an idea crossed her mind. He went to the backyard and caught a few ants and put them in the box. That evening she raised the issue with her husband once again. She asked Shiva whether he provided food for every living being in the world. Siva said to her that was what he was doing all the day. Now Parvati smiled at him and took the box saying, “Oh, My Lord, you forgot a few poor little creatures. Look here I have caught some ants in the morning. You did not even come near this box. I carried it with me all through the day”. Shiva asked her to open the box. When she opened the box she was greatly surprised to see the ants were eating rice. She felt very much about her ignorance and realised the greatness of Lord Shiva. Shivaji was very proud of his victories. He thought he was the one protecting everyone in his kingdom. Though he was arrogant about his achievements he was always obedient to his Guru Samartha Ramdas. So Ramdas wanted to teach him a lesson. Once he was building a fort for which he engaged thousands of workers. He was inspecting them and felt a certain amount of pride. Guru Ramadasa was by his side. Immediately he asked Sivaji to bring some workers to break one huge rock. Shivaji was wondering what the Guru was about. (One of the nature’s wonders is that toads inside the rocks. 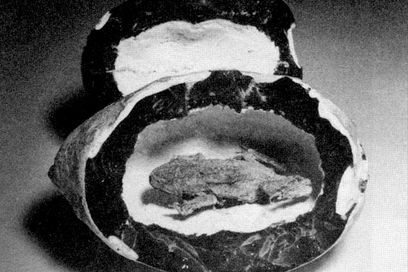 Whenever some stones are rocks are cut, people see toads living inside them). As commanded by his Guru, he brought some workers and asked them to break the rock. Inside the rock they saw water in the holes and frogs (toads) living happily. Pointing out to the frogs Guru asked, “Shivaji are you feeding and looking after these frogs as well? 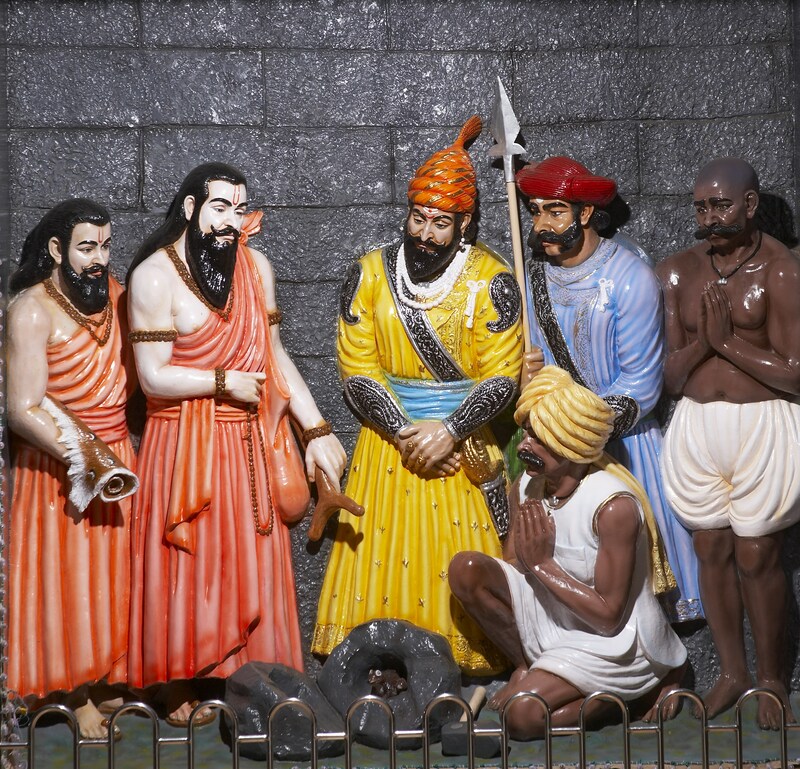 Hearing this Shivaji’s pride was humbled and at once he fell at the feet of his Guru and sought pardon for his conceit. Do Saints’ Samadhis have Divine Power? Can They do Miracles? Post No.1099; Dated 11th June 2014. Hindus believe that by visiting the Samadhis of saints they can be cured of diseases or their problems can be solved in a trice. Is it true? Yes, “It is true”, say great saints. 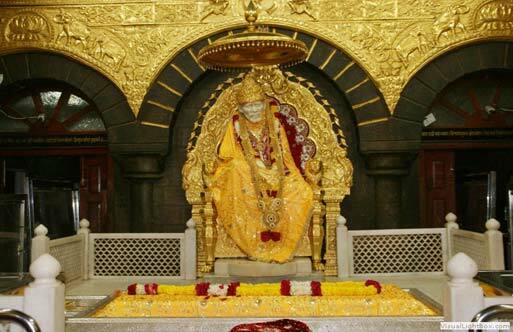 Thousands of devotees visit Manthralaya, where Sri Ragavendra Swami’s Samadhi is located, Shirdi where Sri Baba’s Samadhi is located, Govindapuram Adhistanam where Sri Bodendra Saraswati’s Samadhi is located and several Samadhi’s of Muslim saints in North India. A Samadhi is a place where an enlightened soul is laid to rest after his or her death. Such holy places are called Brundavanam or Adhishtanam. Usually a Tulsi (holy basil) plant or a Shivalainga is installed on the Samadhi. 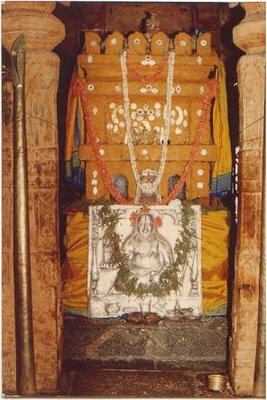 Bodendra was the 58th pontiff of Kanchi Kamakoti Peedam. In the calm silence of the night, a melodious voice, uttering Rama Nama (name of Lord Rama) is heard, rising from subdued tones to a crescendo, and then fading into silence again. 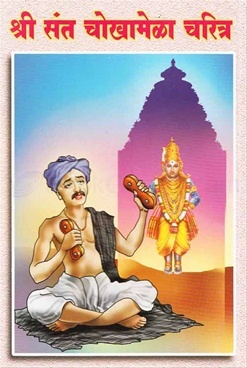 Sri Bodendra recited Rama Nama throughout his life. 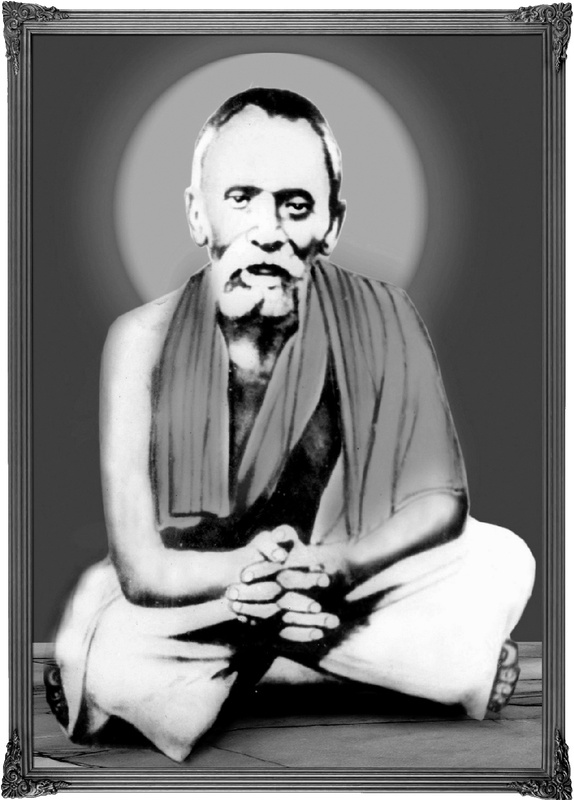 Kanchi Paramacharya (1894-1994) liked to meditate in the serene atmosphere of the Bodendra Adhistana. When he was staying at Tiruvidaimarudur, Paramacharya used to go to Govindapuram and do meditation in the stillness of the night unattended and unseen. That is, nobody would have noticed his departure and suddenly he would be seen sitting there in meditation. Kanchi Paramacharya said that one can hear chanting of Rama nama in the Govindapuram Adhistanam of Sri Bodendra Saraswati. Devotees of Sri Ragavendra believe that his power will remain in the samadhi for 600 years. Sir Thomas Munro, Bellary District collector (later he became Governor of Madras), went to Sri Ragavendra’s Samadhi on the banks of river Tungabadra to discuss a dispute between the Mutt and the Government in the 1800s. When other officials told him that they couldn’t solve it, he himself went there, removed his shoes and hat and went in to discuss the issue. 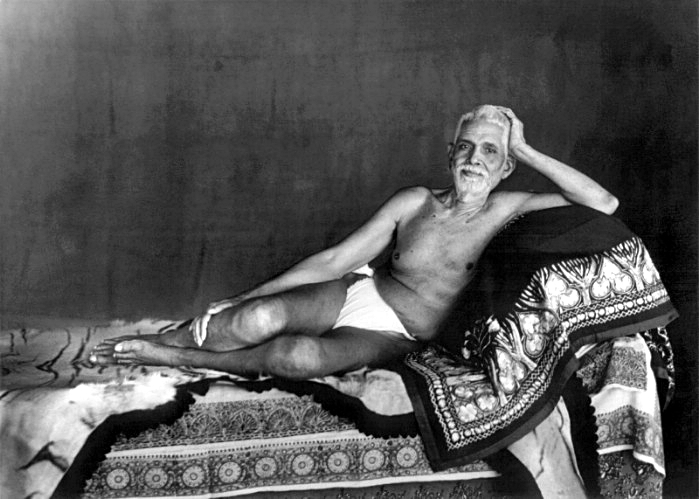 Instead of meeting the Mutt officials, he saw Sri Ragavendra himself emerging from his Samadhi. No one else could see Swamiji. The invisible discussion went in for some time and he went back and quashed the government order. It was duly gazetted. Famous South Indian temples attract millions of people because the Siddhar (enlightened souls) Samadhis are located in their vicinity. 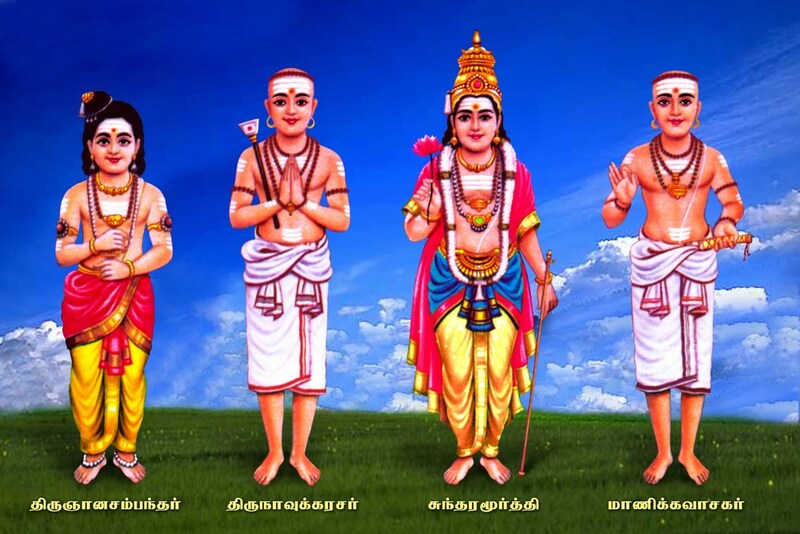 Eighteen famous Siddhars attained Mukti in 18 famous shrines of Tamil Nadu, Kerala and Andhra Pradesh. A famous saint of Maharashtra once paid a visit to a place called Mangalwedha, about eight miles from Pandharpur. At that time a huge fort was under construction at Mangalwedha. While the saint was passing by the high wall of the fort, where hundreds of labourers were working, the wall collapsed and many including the saint were killed, smashed down by the fall of the wall. The devotees of the saint missed him and started a search. After a long and arduous search, they could not find him. Some people of Mangalwedha reported that in all probability the saint must have been crushed to death beneath the fallen wall of the fort. Accordingly, a large number of devotees joined in together in the work of removing the fallen wall. When they did so, they found a number of skeletons of people who had died in the accident. The devotees of the saint wished to single out his bones so that they could raise a tomb over them. The difficulty, however, was that the bones of the people killed were mixed up and they did not know which were the bones of the saint. Now a great devotee of Pandharpur Vithoba — the Deity of the great temple there – happened to pass that way. He understood the perplexity of the devotees and said,“ I shall be able to pick out the bones of the saint”. So saying he took out the bones that were lying helter-skelter and holding them one by one to his ear, he was able to separate saint’s bones from those of others. Such of the bones as were singing the name of the Pandharpur deity – Vithal – he separated from others. The sound of name of God had entered into the very marrow of the saint’s bones by his unceasing practice of chanting the Name. Such is the power of the Name. 5. உலகப் போரின் போது அனைத்தையும் இழந்த துறவி சோகோ! 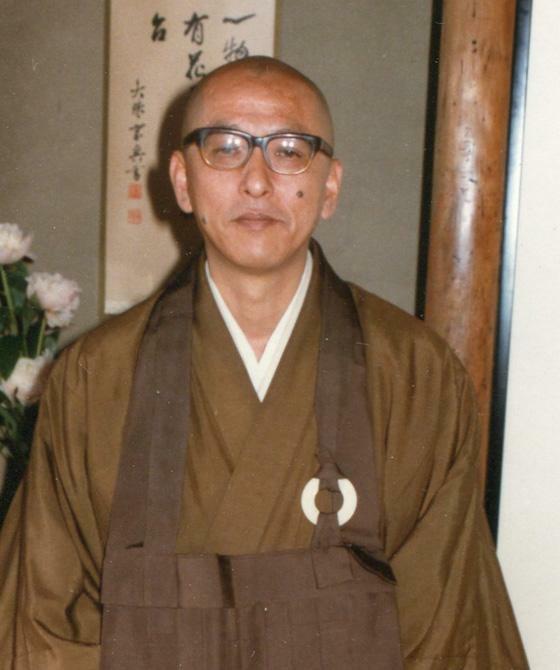 மோரினாகா சோகோ (1925-1995) ஜென் பிரிவைச் சேர்ந்த துறவி. அவர் புத்த மடாலயத்தில் சேர்வதற்கு எத்தனை பாடு பட வேண்டியிருந்தது என்பதை அவரே விளக்கி எழுதியுள்ளார். அதன் சுருக்கத்தைப் பார்க்கலாம். மோரினாகா சோகோ ஜப்பான் நாட்டில் ஓட்ஸு என்ற இடத்தில் 1925ஆம் ஆண்டு பிறந்தார். இரண்டாம் உலகப் போர் உச்ச கட்டத்தை எட்டியிருந்த தருணம்.டோயாமா உயர்நிலைப்பள்ளியில் படித்துக் கொண்டிருந்தார் சோகோ. பள்ளியில் படிக்கும் மாணவர்கள் போர் நடவடிக்கைகளில் ஈடுபட வேண்டாம் என்ற நிலை முதலில் இருந்தது. ஆனால் போர் உக்கிரமாக ஆக அனைவரும் போர் நடக்கும் முன்னணிப் பகுதிகளுக்குச் செல்ல வேண்டிய நிலை ஏற்பட்டது, அதற்கான அரசாங்க உத்தரவும் பிறப்பிக்கப்பட்டது. விஞ்ஞானப் படிப்பு அல்லாத கலை,பொருளாதாரப் பாடங்களைப் படிப்போர் ராணுவத்தில் சேர வேண்டும் என்று உத்தரவு தெரிவித்தது. விஞ்ஞானம் படிக்கும் மாணவர்கள் எதிர்காலத்தில் மருத்துவம் மற்றும் இதர அறிவியல் துறைகளில் போருக்கு உதவக்கூடிய தேவையான அனைத்தையும் செய்யக்கூடும் என்பதால் அவர்களை போர்க்களத்திற்கு நேரடியாக அனுப்ப அரசாங்கம் முன்வரவில்லை. எல்லோரும் ஒரு நாள் இறக்க வேண்டியவர்களே. இன்றோ இருபது வருடங்கள் கழித்தோ, ஒரு நாள் இறந்து தானே ஆக வேண்டும். சோகோவும் தனது உத்தரவை எதிர்பார்த்தவாறு காத்திருந்தார்.அவரது நண்பர்களோ விமானங்களில் ஏறி திரும்பி வர முடியாத ஒரு வழிப் பயணத்தை ஏற்றுக் கொண்டு பயணிக்கலாயினர். வெகு காலமாக மேலை நாடுகள் ஜப்பானைச் சுரண்டி வருவதாக ஜப்பானில் அனைவரும் நம்பி வந்தனர். ஆகவே அந்தச் சுரண்டலிலிருந்து விடுதலை வேண்டி மாபெரும் போர் தொடுக்க வேண்டிய கட்டாயம் ஏற்பட்டதாக அவர்கள் நம்பினர். விமானங்கள் சுட்டு வீழ்த்தப்பட்டன. சோகோவின் நண்பர்களில் பலர் கொல்லப்பட்டனர். ஒரு வழியாக யுத்தம் கோரமான அணுகுண்டால் ஒரு முடிவுக்கு வந்தது.இப்போது ஜப்பானிய மக்கள் அவர்கள் தேவையற்ற தீங்கு பயக்கும் கோரமான ஒரு போரில் அனாவசியமாக ஈடுபடுத்தப்பட்டதாகத் தெரிவிக்கப்பட்டனர். நல்ல வேளையாக இந்த கோரத்தின் மரணப்பிடியிலிருந்து சோகோ தப்பித்து உயிரோடு இருந்தார்.அவரிடம் ஒரு சிறிய ரேடியோ இருந்தது. அதில் ஜெர்மனியைச் சேர்ந்தவர்களைப்பற்றிய போர்க் குற்ற விசாரணைகள் ஒலி பரப்பப்பட்டன. அதை அவர் கேட்டவண்ணம் இருந்தார். விசாரணையின் முடிவில் வழக்கமாக வரும் வார்த்தைகள் -“…. ஆகவே அவர் தூக்கிலிடப்பட வேண்டும்” என்பது தான்! அமெரிக்க நியூஸ் ரீல்கள் ஆங்காங்கே காண்பிக்கப்பட்டன.ஜெர்மானிய தளபதிகள் பொது மக்கள் கூடும் சதுக்கத்தில் பகிரங்கமாக தூக்கில் இடப்படும் காட்சிகள் காண்பிக்கப்பட்டன.இத்தாலிய சர்வாதிகாரியான முஸோலினியையும் அவர் காதலியையும் கழுத்தில் ஒரு கயிறால் கட்டி தெருத் தெருவாக மக்கள் இழுத்துச் செல்வதையும் ஆங்காங்கே குழுமி இருந்த மக்கள் கல்லால் அவர்களை அடித்தவாறு இருப்பதையும் சோகோ பார்த்தார். ஒரு வழியாக மாணவர்கள் ஒவ்வொருவராகப் பள்ளிக்குத் திரும்பினர்.ஆனால் சோகோவுக்கு ஒன்று மட்டும் புரியாத புதிராக இருந்தது. நன்மை எது தீமை எது அவற்றை எப்படி இனம்காண்பது என்பது தான் அவருக்குள் பிறந்த கேள்வி! மாணவர்கள் ஒருவருக்கொருவர் இதைப் பற்றியே விவாதித்துக்கொண்டிருந்தனர். போரின் முடிவில் ஜப்பானியரின் அறநெறிப் பண்புகள் மிகவும் தாழ்ந்திருந்தன. போர் முடிவதற்கு ஒரு ஆண்டுக்கு முன்பு சோகோ ஒரே அடியில் தனது தாயையும் தந்தையும் இழந்தார். ஏற்கனவே அவர் தந்தை நோய்வாய்ப்பட்டிருந்தார். இதில் அவர் தன் மனைவியை – சோகோவின் தாயை- இழக்கவே அதை அவரால் தாங்கிக் கொள்ள முடியவில்லை. சோகோவின் தாய் இறந்த மறுநாள் காலை அவர் கோமாவில் மயங்கி உணர்வற்று இருந்தார்.அப்படியே இறந்தும் போனார். இந்த நேரம் பார்த்துத் தான் சோகோவிற்கு போரில் உடனே சேருமாறு அரசாங்க ஆணை வந்திருந்தது. இரண்டு நாட்களில் சேர வேண்டும்! அதற்குள்ளாக தாயாருக்கும் தந்தைக்கும் உரிய அடக்க காரியங்களை அவர் கவனித்தாக வேண்டும். ஆனால் போர் முடிந்தவுடன் வந்த நிலச்சீர்திருத்தத் திட்டங்களினால் குடும்பத்தின் நிலம் முழுவதும் பறி போனது. உள்ளங்கையளவு நிலம் கூட மீதி இருக்கவில்லை. எது எப்போதும் சாசுவதமாக இருக்கும் என்று சோகோ நம்பினாரோ அது மாயையாகப் போனது. போரின் பிறகு ஏற்பட்ட புனருத்தாரணக் கொள்கைகளின் படி வங்கிகளும் அதிரடிக் கொள்கை மாற்றத்திற்கு உள்ளாயின. தனது குழந்தைகளைப் பாதுகாக்க அவரது தந்தையார் எடுத்திருந்த இன்ஷூரன்ஸ் மூலம் ஒரு யென் கூட அவருக்குக் கிடைக்கவில்லை! ஆனால் இந்தச் சீர்திருத்த நடவடிக்கைகளினால் வாழ்க்கைத் தரம் ஒன்றும் உயரவில்லை. விலைவாசி ஏறிக் கொண்டே போனது.இன்று ஒரு யென்னுக்குக் கிடைக்கும் ஒரு பொருள் மறு நாள் பத்து யென்னுக்குத் தான் கிடைக்கும்.அதற்குச் சில நாட்களுக்குப் பின் அது நூறு யென் ஆகி விடும்!. சோகோவோ மாணவர். இரண்டு கைகள் இருக்கின்றன ஆனால் எப்படிப் பிழைப்பது? நல்லவேளை கிரிமினல்களுடன் சேர்ந்து கொள்ளை அடிக்கும் தொழிலில் அவர் ஈடுபடவில்லை. பள்ளிப்படிப்பு முடிந்தது. ஆனால் மேலே படிக்க சோகோவுக்கு மனமில்லை. யோசித்துப் பார்த்தார். வாழ்க்கையில் என்ன செய்வதென்று அவருக்குத் தெரியவில்லை. வெறும் புத்தகப் படிப்பு. கொள்கைகள் பற்றிய வெற்று அறிவு! தன் மீதான சுயக் கட்டுப்பாடு இல்லாத வாழ்க்கை! விதியின் விசித்திரமான வழிகள் தான் இருக்கின்றனவே! ஒரு நாள் விசித்திரமான சூழ்நிலையில் பல ஜென் ஆலயங்களுக்கு அவர் செல்ல ஆரம்பித்தார். ஜென் பிரிவு ஏழாம் நூற்றாண்டில் ஜப்பானில் பரவியது. ஜென் குருமார்கள் 16ஆம் நூற்றாண்டில் ராஜ தந்திரிகளாகவும் ராஜாங்க தூதுவர்களாகவும் பணியாற்றினர். நீங்கள் ரமணரைச் சந்தித்தவர்களின் பட்டியலில் ராஜாஜி அவர்களின் பெயரையும் குறிப்பிட்டுள்ளீர்கள். எனக்குத் தெரிந்த வரையில் ராஜாஜி ஒருபோதும் மஹரிஷியைச் சந்தித்ததில்லை. மஹாத்மா மஹரிஷியைச் சந்திக்கவிருந்த திட்டத்தையே கூட அவர் மாற்றியவர். அதற்காகக் கடுமையாக விமரிசனத்திற்குள்ளானார். இந்த மூவரையும் நான் கொண்டாடுபவன் என்றாலும் கூட இந்த வரலாறு தான் எனக்குத் தெரியும். ராஜாஜி எப்போதேனும் மஹரிஷியைச் சந்தித்திருந்தால் அது பற்றிய குறிப்பைத் தாருங்கள். 1936ஆம் வருடம் ஜனவரி மாதம் ஆஸ்ரமத்திற்குச் சென்றேன். அங்கு இருந்த பக்தர்களுடன் சில மேனாட்டவரும் ஹாலில் இருந்தனர். அங்கிருந்த தெய்வீக சூழ்நிலையும், ஹாலில் நிலவிய ஆழ்ந்த அமைதியும் என்னை மிகவும் கவர்ந்தது.சோபாவில் உட்கார்ந்த பகவான் எங்கும் அன்பையும் எளிமையையும் பொழிந்தார். நான் விசிஷ்டாத்வைதத்தைச் சேர்ந்தவன்.எனவே அந்த தத்துவத்தில் பரிச்சயம் கொண்டவன்.பகவானுடைய உபதேசத்தினால் கவரப்பட்ட நான் எவ்வாறு விசிஷ்டாத்வைதத்தையும் அத்வைதத்தையும் ஒன்றுபடுத்துவது என்று கேட்டேன். சிறிது நேரங்கழித்து பகவான் “எப்படி இருந்தாலும் உன்னுடைய கர்மாவை அனுபவிக்க வேண்டும். அப்படியிருந்தால் நீ காப்பாற்றப்படுவாய்” என்றார். பகவானின் இந்த உபதேசத்தை மீண்டும் பலமுறை எண்ணிப் பார்த்து, அதனால் பலன் அடைந்திருக்கிறேன். ராஜாஜி மஹரிஷியை தரிசித்ததும், அவருடைய அன்பையும் எளிமையையும் கண்டு மகிழ்ந்ததும் அவருடைய உபதேசத்தால் அவர் கவரப்பட்டார் என்பதும் மஹரிஷியின் அருளுரையை அவர் எண்ணி பலன் அடைந்ததும் அவர் வார்த்தைகளிலேயே மேலே படித்த பிறகு இனி சந்தேகம் யாருக்கும் எழாது.
. திருவண்ணாமலைக்கு காந்திஜி வந்தபோது அவர் மஹரிஷியை தரிசிக்கும் வாய்ப்பை உருவாக்கவில்லை என்பது பற்றிப் பார்ப்போம். காந்திஜி தனது பயண நிகழ்ச்சிகளில் எவ்வளவு கண்டிப்பானவர் என்பதை அவரது வாழ்வையும் வாக்கையும் விளக்கும் நூறு தொகுதிகளைப் படித்தோர் நன்கு உணர முடியும். ஜம்னாலால் பஜாஜுடன் வந்த ராஜேந்திரபிரசாத், மஹாதேவ தேசாய் ஆகியோரை ரமணாஸ்ரமத்திற்கு அனுப்பியவரே மஹாத்மா தான். அவர் நினைத்திருந்தால், அவரது பயண நேரம் அனுமதித்திருந்தால் நிச்சயம் அவர் ரமணாஸ்ரமம் சென்றிருக்கக் கூடும். ஆகவே முழு பொறுப்பாளராக ராஜாஜியை இதில் விமரிசிப்பது தவறோ? கிருஷ்ணஸ்வாமி பகவானிடம் சொன்னார்:”நமது நண்பர்களில் சிலர் மஹாத்மாவுக்கு ஆஸ்ரமத்திற்கு விஜயம் செய்யுமாறு யோசனை கூற வேண்டுமென்று விரும்பினர்.ஆனால் அவர்கள் ஓ.பி.ராமசாமி ரெட்டியாரைக் கலந்து பேசிய போது அவர் இங்கே எங்களில் யாரும் மஹாத்மாவை அணுக முடியாது. ராஜாஜி மட்டுமே செல்வாக்கு படைத்தவர்” என்று சொன்னார்.. இதைக் கேட்ட பகவான் “அவாயெல்லாம் இங்கேயெல்லாம் வரவிடமாட்டா” என்றார். ஒரு வாரத்திற்கு முன்னால் பகவான், “மஹாத்மா முன்னொரு முறை (ஆஸ்ரமத்திலிருந்து ஒரு பர்லாங் தூரத்தில் உள்ள) இங்குள்ள மாட்டு சந்தை நடக்கும் இடத்திற்கு வந்தார். அவரது பணியை குறிப்பிட்ட நேரத்திற்கு முன்னாலேயே முடித்தார்.நிதியளிப்பைப் பெற்றுக் கொண்டு சென்று விட்டார்.” என்று சொல்லிக் கொண்டிருந்தார். கிருஷ்ணஸ்வாமி, மஹாத்மா அடிக்கடி பகவானைப் பற்றி நினைத்துக் கொண்டிருப்பதாகவும் அவர் மேல் அபார மரியாதை வைத்திருப்பதாகவும் சொன்னார் என்ற இன்னொரு செய்தியையும் சொன்னார். அதற்கு பகவான்,”ஆமாம், ஆமாம். அது அப்படித்தான்! எப்போதெல்லாம் யாராவது மன அமைதி இல்லை என்று அவரிடம் சொல்கிறார்களோ அவர்களை எல்லாம் அவர் பாக் செய்து, ”ரமணாஸ்ரமத்திற்குப் போ, அங்கு சிறிது காலம் இருந்து விட்டு வா” என்று சொல்லி இங்கே அனுப்பி விடுவார்” என்றார். ஆகவே தேவராஜ முதலியாரின் நாட்குறிப்பு நடந்ததைத் தெளிவாக விளக்குகிறது. மஹாத்மா காந்திஜியும் மஹரிஷியும் சந்திக்க வேண்டும் என்ற ஆர்வம் கொண்டவர்கள் அதற்கு ராஜாஜி முனைப்பாக ஏதேனும் செய்திருக்கலாம் என்ற ஆதங்கப் பட்டிருப்பது நிஜமே. இனி மஹாத்மா மறைவுச் செய்தியைக் கேட்டவுடன் மஹரிஷி கண்களில் நீர் கசிந்ததையும் அன்று ஆஸ்ரமத்தில் பக்தர்கள் ரகுபதி ராகவ ராஜாராம் பாடலை தொடர்ந்து இசைத்ததையும் ஆஸ்ரம ஏடுகள் மூலமாக அறிகிறோம். மஹாத்மாவைப் பற்றியும் மஹரிஷியைப் பற்றியும் ஏராளமான சுவாரசியமான செய்திகள் இருந்தாலும் முத்தாய்ப்பாக ஒன்றே ஒன்றை மட்டும் இங்கே தருகிறேன். நேற்று ஹரீந்திரநாத் சட்டோபாத்யாயா மஹாத்மாவின் போட்டோவைக் காண்பித்து, “காந்திஜியும் மஹாத்மாவும் சந்திக்காமல் போனது பரிதாபமே” என்றார். பகவான் ரமணர் : சில காலத்திற்கு முன்னர் அவர் திருவண்ணாமலை வந்திருந்தார்.மலையைச் சுற்றி உள்ள சாலையில் ஆசிரமத்திற்கு அப்பால் அவரது கூட்டம் ஏற்பாடாகி இருந்தது.இங்கிருந்தோர் அவர் திரும்பும் போது ஆஸ்ரமத்திற்கு வருவார் என்று நினைத்தனர்.ஆனால் கூட்டத்தின் நெருக்கடியினால் அவரால் அது முடியாமல் போனது. அவர் ஸ்டேஷனுக்கு நேராகச் சென்று விட்டார்.பின்னால் இதற்காக அவர் மிகவும் வருத்தப்பட்டதாகத் தெரிகிறது. சங்கர்லால் பேங்கரும் ஜம்னாலால் பஜாஜும் இங்கு வந்து ஸ்கந்தாஸ்ரமத்தைப் பார்த்தனர். அவர்கள் மஹாத்மாவை இங்கு வந்து சில நாட்கள் தங்குமாறு தூண்ட விரும்பினர்.ஆனால் அது நடக்கவில்லை. சபர்மதியிலோ அல்லது வார்தாவிலோ யாராவது மனச்சோர்வால் பாதிக்கப்பட்டால் மஹாத்மா அவர்களை நோக்கி,”ரமணாஸ்ரமத்திற்குச் செல்லுங்கள். அங்கு ஒரு மாதம் தங்கி இருந்துவிட்டுப் பின் வாருங்கள்” என்பார். ராமசாமி ரெட்டியார் முதல் மந்திரி பொறுப்பை ஏற்றுக் கொண்ட பிறகு மஹாத்மாவை பார்க்கச் சென்ற போது மஹாத்மா அவரை எவ்வளவு காலமாக ரமணாஸ்ரமத்திற்குப் போய்க் கொண்டிருக்கிறீர்கள் என்று கேட்டதாகத் தெரிகிறது. அவர் முப்பது வருட காலமாகப் போய்க் கொண்டிருப்பதாக பதில் சொன்ன போது மஹாத்மா, “அப்படியா! நான் மூன்று முறை முயற்சி செய்தேன். ஆனால் இதுவரை அங்கே போக முடியவில்லை” என்றார். அவரால் என்ன செய்ய முடியும்? ஒரு கணம் கூட அவரைத் தனியே இருக்கவிடாத போது அவரால் எப்படி வர முடியும்? பகவான் இன்றைய பேப்பரில் வெளியாகி இருந்த, ”மஹாத்மா அந்த துயர சம்பவத்திற்கு முதல் நாள் தனது மரணத்தைப் பற்றி ஒரு கனவை முன்கூட்டியே கண்டார்.ஆகவே வெகு சீக்கிரமாக அவரது பேப்பர்களைப் பார்த்து முடித்தார். அதுவே அவர் பிரார்த்தனைக்கு தாமதமாக வரக் காரணம் ஆனது” என்ற செய்தியைப் படித்தார். பிறகு கூறினார்:” ஆம்! ஞானோதயம் பெற்றோருக்கு அந்த அளவு கூட என்ன நடக்கப் போகிறது என்பது முன்கூட்டியே தெரியாதா என்ன? அவர்கள் அறிவார்கள். ஆனால் மற்றவர்களுக்குச் சொல்ல மாட்டார்கள்” என்றார். ஆனால் இதற்கெல்லாம் தெளிவாக பதிலை ரமணரே கூறியிருக்கிறார். “எந்த ஒரு மஹாசக்தி இங்கே இருக்கிறதோ, அதுவே அவரையும் வழி நடத்துகிறது” என்று மஹாத்மாவைப் பற்றி அவர் கூறியுள்ளார். அந்த மஹாசக்தி திருவுள்ளப்படியே எல்லாம் நடக்கிறது. அவரவர் பணியை அவரவர்க்கு ஒதுக்கிட்டுத் தந்த அந்த மஹாசக்தி இவர்களின் சந்திப்பு தேவை என்றால் அதை நடத்தி முடித்திருக்காதா, என்ன?அல்லது அந்த மஹாசக்தியே இந்த இருவருக்குள்ளும் இருந்து அவர்கள் ஒரே சக்தியாக இயங்கிய போது, அதை அவர்களும் நன்கு உணர்ந்திருந்த போது அவர்கள் சந்திக்க வேண்டும் என்ற தேவை தான் ஏது?! “ஏதோ ஒரு சக்தி ஞானியின் தேகத்தின் மூலமாக வேலை செய்கிறது. அவனது சரீரத்தை உபயோகித்து வேலையை முடிக்கிறது” என்று அணுக்க பக்தர் தேவராஜ முதலியாரிடம் (5-5-1946 அருளுரை) கூறிய பகவான் ரமண மஹரிஷி ஒரு போதும் ‘தான் தான் அந்த மஹாசக்தி’ என்பதை வெளிப்படையாகக் குறிப்பிட்டதில்லை. ஏதோ ஒரு சக்தி அனைவரையும் இங்கு இழுக்கிறது என்று அவர் குறிப்பிட்ட போது அந்த சக்தியால் இழுக்கப்பட்ட பாக்கியவான்களில் மஹாராஜாக்கள், மஹாராணிகள், அரசியல் தலைவர்கள், எழுத்தாளர்கள், கவிஞர்கள், யோகிகள், சாமான்யர்கள் ஆண்டிகள் உள்ளிட்டோர் இருப்பதைப் பார்த்து பிரமிக்க முடிகிறது. ஒவ்வொரு வருக்கும் ஒரு அனுபவம்;ஒரு செய்தி! மைசூர் மஹாராஜா,பரோடா மஹாராணி, மகாகவி பாரதியார், ராஜேந்திர பிரசாத், மஹாதேவ தேசாய், ராஜாஜி, சாமர்செட் மாம்,பரமஹம்ஸ யோகானந்தா, காவ்யகண்ட கணபதி சாஸ்திரிகள், பால் பிரண்டன், சாட்விக் என்று ஆரம்பித்தால் இந்தப் பட்டியல் ஆயிரத்தையும் தாண்டுகிறது. “அந்த சக்தியிடம்” அவர்கள் அனுபவித்தது என்ன? ஒரே வாக்கியத்தில் அதிசயமான, இறைவனின் சந்நிதி பாக்கியம் தான் என்று சொல்லி விடலாம். உத்தரப்பிரதேசத்திலுள்ள சிவநகர் மஹாராஜா பகவானிடம் புகலிடம் அடைந்து தனக்கு ஞானம் அளிக்க வேண்டுமென்று விண்ணப்பித்தார். பகவான் நாம மகிமையையும் பிரம்ம ஞானம் பற்றி அஷ்டாவக்ர கீதை உரைப்பதையும் எடுத்துரைத்தார். பிரம்மஞானம் அடைய எவ்வளவு நேரமாகும் என்ற கேள்விக்கு பிரம்மஞானம் உடைய குருவிடம் முழு சரணாகதி அடைந்து ‘நான் –எனது’ என்ற எண்ணங்களை விட்டு விட்டால் குதிரையின் அங்கவடியில் ஒரு காலை வைத்து மறு காலைத் தூக்கி வைப்பதற்கு ஆகும் நேரம் தான் தேவை என்ற அஷ்டாவக்ர கீதைப் பகுதியை விவரித்த பகவான், “ அவ்வளவு நேரம் கூட ஆகாது. அகம்-பாவம் மறைந்த உடனேயே ஆன்ம பாவம் ஒளிரும் என்று தன் அனுபவத்தில் கண்டதை உரைத்தார். அனைவரும் பிரமித்தனர். ஹரீந்த்ர நாத் சட்டோபாத்யாயா என்ற வங்கக் கவிஞர் அரவிந்தாஸ்ரமத்தில் இரு வருடம் இருந்தவர். அவர் பகவானை தரிசித்துப் பேசுகையில் தான் 4000 பதினான்கு வரிப்பாடல்களையும் 50000 வரிகள் கொண்ட கவிதையையும் மேலும் பல கவிதைகளையும் நாடகங்களையும் இயற்றியதைக் கூறினார். அவரது நாடகம் ஒன்றின் பகுதியை உணர்ச்சியுடன் அவர் நடித்துக் காட்டினார். பின்னர் அவர் கேட்டார்:”அதெப்படி, பகவானே!உங்கள் சந்நிதியில் நாங்கள் கண்ணீரால் மூச்சடைத்துத் திணறுகிறோம்?” .பகவான் மௌனமாகப் புன்னகை புரிந்தார். பின்னர், “மனதைத் தொடும் விஷயங்களைப் படித்தாலோ கேட்டாலோ கண்ணீர் பொங்கி வழிகிறது” என்றார். பிறிதொரு சமயம் இதே பொருள் பற்றிப் பேச்சு வருகையில் ”கதாகாலக்ஷேபம் செய்பவர்கள் கல்நெஞ்சக்காரர்கள் போலும். எப்படி அவர்களால் உணர்ச்சி பொங்க கண்ணீர் வடிக்காமல் தொண்டை கட்டாமல் கதையை சொல்லி கொண்டே போக முடிகிறது” என்று வியந்தார். பகவானுக்கு பக்தர்களின் சரித்திரத்தைப் படிக்கும் போதெல்லாம் உணர்ச்சி கட்டுமீறும்; கண்ணீர் பொங்கும்; படிப்பதை நிறுத்தி விடுவார். பரம ஞானி ஒரு சிறந்த பக்தனாக இருக்க முடியும், ஞான மார்க்கமும், பக்தி மார்க்கமும் இறைவனை அடைய இரு வழிகளே என்பதைத் தன் வாழ்க்கையிலேயே வாழ்ந்து காண்பித்து அந்த உண்மையை நமக்கு உணர்த்தியவர் அவர். திருவண்ணாமலையில் பிரசங்கம் செய்ய வந்த மஹாகவி பாரதியார் ரமண சந்ந்நிதியில் வந்து அமர்ந்து உத்வேகம் பெற்றார். பின்னால் பகவானிடம் இது பற்றிக் கேட்ட போது, பாரதியார் படத்தைப் பின்னால் பார்த்த போது தான் அவர் தான் வந்திருந்தார் என்று ஊகிக்க முடிகிறது என்று அருளினார். இப்படி தன்னை யாரென்று சொல்லிக் கொள்ளாமல் பகவான் எதிரே அமர்ந்ததனாலேயே உத்வேகம் பெற்ற பெரியோர்கள் ஏராளம்! ‘ஆடோபயாகிராபி ஆஃப் தி யோகி’– என்ற உலகப் பிரசித்தி பெற்ற நூலை எழுதியவரும் கிரியா யோகத்தை அமெரிக்காவிலிருந்து உலகெங்கும் பரப்பியவருமான பரமஹம்ஸ யோகானந்தர் ரமண மஹரிஷியை (29-11-1935 அன்று) சந்தித்தார்.மக்களிடம் ஆன்மீக முன்னேற்றத்தை எப்படி எழுப்புவது என்ற அவர் சந்தேகத்திற்கு ஒவ்வொருவருடைய ஆன்மீக முனேற்றத்திற்கு தக்கபடி அவரவருக்கேற்றபடி குறிப்புகளை வழங்க வேண்டும் என்று தெளிவு படுத்தினார் ரமணர். துன்பத்தைப் போக்க யோகம் மதம் ஆகியவை உதவுமா என்ற அவர் கேள்விக்கும் அவை துன்பத்தைப் போக்க உதவும் என்று தெளிவு படுத்தினார். திருவண்ணாமலை ரகசியத்தைப் பற்றி பால்பிரண்டன்(23-1-1936 அன்று) பல்வேறு கேள்விகளைக் கேட்டு பகவானைக் குடைந்தார். மலையில் குகைகள் உள்ளனவா என்ற பிரண்டனின் கேள்விக்கு எனது அகக் காட்சிகளில் குகைகள், நகரங்கள், தெருக்களைக் கண்டுள்ளேன் என்றார் ரமணர். சித்தர்கள் அதனுள் இருக்கிறார்களா என்றார் பிரண்டன். பெரிய சித்தர்கள் உள்ளனர் என்று பதிலளித்தார் பகவான். சித்தர்கள் இமயமலையில் இருப்பதாக அல்லவா சொல்லப்படுகிறது என்று பிரண்டன் விடாமல் கேட்ட போது கைலாஸம் சிவனின் இருப்பிடம் தான்; ஆனால் சிவனே தான் இந்த மலை“ என்று தீர்க்கமாக பதில் அளித்து அனைவரையும் பிரமிக்க வைத்தார் மஹரிஷி. போலந்து தேசத்தைச் சேர்ந்த ஒரு பெண்மணி தன் பெயரை உமாதேவி என்று மாற்றி வைத்துக் கொண்டார்.அவர் காஷ்மீரிலிருந்து வந்து (10-11-1936 அன்று) பகவானை தரிசனம் செய்தார். காஷ்மீரில் எடுத்த காட்சிகளை அவர் அனைவருக்கும் ஆசிரமத்தில் காண்பித்த போது “பயணம் செய்யும் சிரமம் செய்யாமலேயே நாம் அந்த இடங்களைப் பார்த்து விட்டோம்” என்று நகைச்சுவையுடன் கூறினார் பகவான். ஆனால் இதன் ஆழ்ந்த பொருள் உண்மையில் வேறு. காலம், வெளி கடந்த தன்மையில் மஹரிஷி ஏராளமானோருக்குத் தன் எங்கும் நிறைந்திருக்கும் தன்மையைக் காட்டியுள்ளார். பின்னால் ஜனாதிபதியாக இருந்த பாபு ராஜேந்திர பிரசாத் ரமணாசிரமத்திற்கு வந்து சில நாட்கள் தங்கி இருந்தார். விடைபெறும் நாளில் (18-8-1938 அன்று) பகவானிடம் சென்று,” நான் மஹாத்மா காந்திஜியின் அனுமதியின் பேரில் தான் இங்கு வந்துள்ளேன். அவரிடமே சீக்கிரம் திரும்பிப் போக வேண்டும். அவருக்கு ஏதேனும் செய்தி தருகிறீர்களா” என்று கேட்டார். “அவரிடம் அத்யாத்மீக சக்தி வேலை செய்கிறது; அதுவே அவரை வழி நடத்துகிறது. அது போதும். வேறென்ன வேண்டும்!” என்று பதிலிறுத்தார் ரமணர். எந்த சக்தி இங்கிருந்து வழி நடத்துகிறதோ அதே சக்தி அவரையும் வழி நடத்துகிறது என்று ஒரு முறை மஹாத்மாவைப் பற்றி ரமணர் குறிப்பிட்டு ‘அந்த ஏதோ ஒரு சக்தியைப் பற்றிக்” குறிப்பிட்டுள்ளார். சிவனே திருவண்ணாமலை என்ற ரகசியத்தையும், அங்கிருந்து இயக்கும் அபூர்வ சக்தி ரமணரை ஆட்கொண்டதையும் அந்த சக்தி உலகத்தில் உள்ள பாக்கியம் பெற்றோரை அவர் வசம் இழுத்ததையும், உயரிய ஞானியாக இருந்தாலும் காட்சிக்கு எளியராய், பரம பாகவதனாக பக்தி செலுத்தி கண்ணீர் பொங்க இறைவனை அவர் வழி பட்டதையும், பெரும் யோகிகளுக்குக் கூட உத்வேகம் ஊட்டியதையும் கவிஞர் போன்ற யுக புருஷர்களுக்கு ஆன்ம சக்தி அளித்ததையுமே ரமணரைச் சந்தித்த விதவிதமான இறை அன்பர்களிடமிருந்து நாம் தெரிந்து கொள்கிறோம். மஹரிஷி ரமணர் ஒரு திறந்த புத்தகம்; அந்த புத்தகத்தைப் படித்தவர்களைப் பற்றிய குறிப்புகள் அடங்கிய புத்தகங்கள் ஏராளம் உள்ளன! அவற்றை ஊன்றிப் படிக்கும் போது மஹரிஷி ரமணர் குறிப்பிடும் “ஏதோ ஒரு சக்தி” அவரே தான் என்பதை உணர முடியும். பகவானைச் சந்தித்த பாக்கியவான்களின் சந்திப்புகளில் நிகழ்ந்ததைப் படிக்கும் போது அது நமது ஆன்ம ஒளியைத் தான் தூண்டுகிறது! – இன்றும், என்றும்! Alexander the Great (356-323 BC) was the king of Macedonia. He conquered several countries from Greece to India. Pattinathar was a Tamil saint who lived in tenth century AD in Tamil Nadu. Alexander and Pattinathar were born rich. Both of them sent a powerful message by their deeds: “ In the end we leave empty handed”. When death was neaing Alexander reflected within himself: “ I have committed so many evil deeds to amass all this wealth. Now death’s call has come. When departing I have to leave all the riches behind and go alone without taking a single coin”. He told his followers and courtiers : “when my body is taken t the grave, you have to seethat my two hands are stretched out, with palms open, and fully exposed,while the rest of the body is covered, so that my subjects may see that I, a great king, the richest man in the world, went on my final journey, quite empty handed, as I could not take anything with me”. Alexander was buried according to his wish. Happiness does not consist in storing or accumulating wealth. We bring nothing with us when we came in to the world and we take nothing with us when we leave the world. Pattinathar story was another example to emphasize this. Pattinathar was a rich man doing roaring business in the harbour city of Chola country. He had no issue. A bright child was picked up from a garden in Tiruvidaimarudur and was reared by Pattinathar. Ne day the boy disappeared after asking his mother to give a box to Pattinathar. When Pattinathar opened it he found an eyeless needle and a palm leaf on which a conundrum was written. He immediately distributed his wealth, renounced life and became an ascetic. He has sung lot of hymns in praise of Lord Shiva. We see the message of leaving empty handed in most of his hymns. Alexander showed it in body. Pattinathar said it in his poems. by Shiva, Oh Kachi Ekampa. Pattinathar Poems translated by Dr T N Ramachandran. Pictures are taken from other blogs. Ramanujacharya lived in Tamil Nadu and Karnataka between 1017 AD and 1137 AD. He lived for 120 years. On account of old age the renowned Vaishnava preceptor and propounder of the philosophy of Vishistadwaita (Qualified Monism), Ramanuja had become very weak. Therefore, while going to the river for his daily bath he had to take the help of someone. Going to the river he would rest his hand on the shoulder of one of his Brahmin disciples. But while returning home, he took the help of a disciple, belonging to the lowest caste Shudra. The orthodox people were greatly perturbed at this peculiar behaviour of the preceptor. Therefore one day some of them got together and went to Ramanuja and said to him, “Revered teacher, should you desire, you can take the help of the untouchable disciple before your bath. But once after the bath you have made yourself clean, you ought not to touch him”. 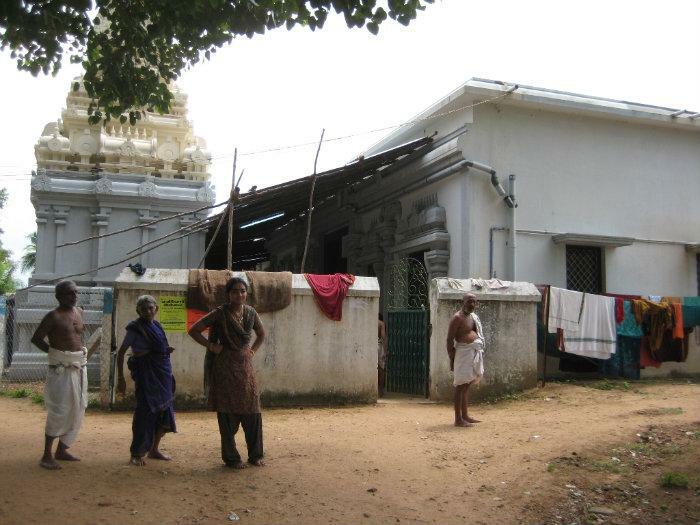 “One of Ramanuja’s disciples, by name Kanchipurna, was serving in the temple at Kancheepuram. Although a Shudra, Kanchipurna was so very pious and good that the people of the place had great respect and reverence for him. At present, there is a temple at Kancheepuram where Kanchipurna’s image has been installed and where he is worshipped as a saint. Young Ramanuja came under Kanchipurna’s influence and had such reverence for him that he invited him to dinner in his house. Ramanuja’s intention was to attend on Kanchipurna and personally serve him at dinner and himself take meals afterwards. Unfortunately, Kanchipurna came to dinner when Ramanuja was not at home, and took his meals being served by Ramanuja’s wife. When Ramanuja returned home, he found the house washed and his wife bathing for having served meals to a Shudra. This irritated Ramanuja very much and turned him against his wife who was an orthodox lady of a different social ideal. 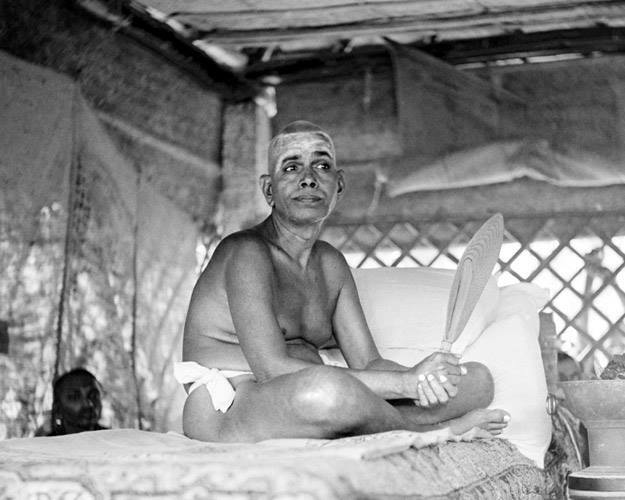 After a few incidents of this nature, Ramanuja abandoned the life of a householder and became a Sannyasin”— Swami Sivananda of Divine Life Society. “You must have heard of the three great teachers : Shankara, Ramanuja and Madhwa. They have established their systems of philosophy in India. Ramanuja went to a Master and asked him to initiate him. The Master gave him God’s name and also advised him not to give this NAME to anybody, adding if he did so, he would go to hell. At once Ramanuja went to the top of the local temple (at Sri Perumpudur near Madras) and shouted, “ I am going to give you all a NAME which will save you. My master has given me that Name”. He uttered the name loudly so that everybody could here. 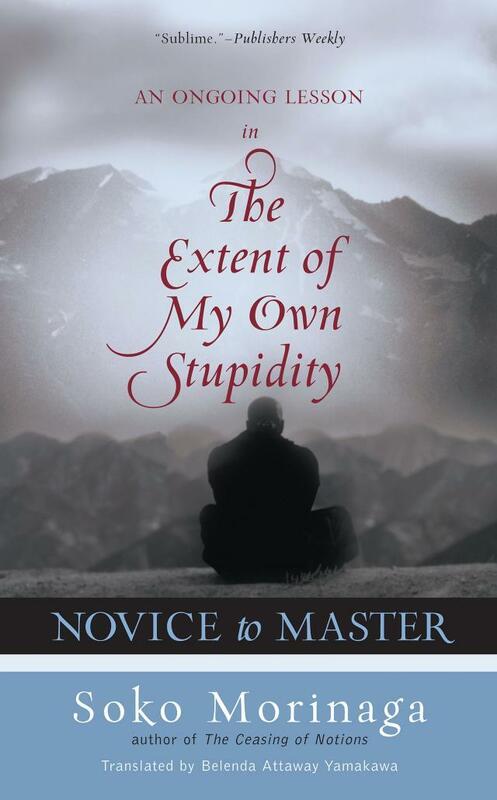 The Master heard about it and asked why he did so in spite of his warning. Ramanuja’s reply was, “I am prepared to go to hell a hundred times if I can save thousands”.